1857 Envelope to Peterborough franked by a 1d Rose-Red, SG 40 tied by a fine 491 Macclesfield numeral with, on the reverse, a very fine SUTTON (under PETERBOROUGH) UNDATED CIRCLE IN BLUE. 1842 Entire from Manchester to Swettenham Hall, Cheshire, showing a very fine boxed MISSENT/to/CHESTER. 1859 Local Macclesfield envelope, with, on the reverse, a fine PRESTBURY undated circle in Green. 1856 Mourning envelope addressed to Liverpool franked by a 1d Red-Brown, SG 8, showing on the reverse by a very fine BRIDGE.ST undated circle in Red, under Stockport. 1844 1d Pink envelope, with letter, addressed to Liverpool, and with, on the reverse, a HANDLEY (under Chester) undated circle. 1813 Cover addressed to Manchester cancelled on the reverse by a fine STOCKPORT/179 circular undated mileage in Purple, CH 761. 1809 Entire aderessed to Manchester wth, on the reverse, a very fine STOCKPORT/J79 in Purple. 1900 Postcard from Guatemala to London, probably sent via Liverpool and put onto the London & Crewe Sorting Carriage, showing a superb boxed L & C/S.C. of the London & Crewe/Sorting Carriage, Wilson 203. 1705 Entire from NAMPTWICH addressed "To Mr John Moore at his warehouse on Dice Key in Thames Street in London" showing a superb IV/16 London Bishop mark. 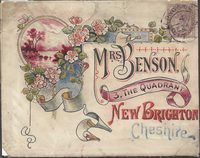 1880 1½d Venetian Red, SG 167, tied to 1d Pink stationery envelope from ALDERLEY EDGE to Berlin. 1794 Entire to Rochdale showing on the front a very fine framed Horseshoe STOCKPORT in purple, CH 742. 1830 Entire to Congleton showing a fine STOCKPORT/PENNY POST. Scarce. 1852 Envelope to York showing a fine "MACCLESFIELD/JU 15/1852/3" Skeleton datestamp in Blue. 1811 Entire from London to Ringwaqy Chapel, Cheshire showing a very fine boxed MISSENT/to/CHESTER and a fine CHESTER/190 circular dated mileage. 1877 Mourning Envelope from Crewe to Camelford showing a fine CORNWALL/R.S.TENDER cds, W319, Index B.